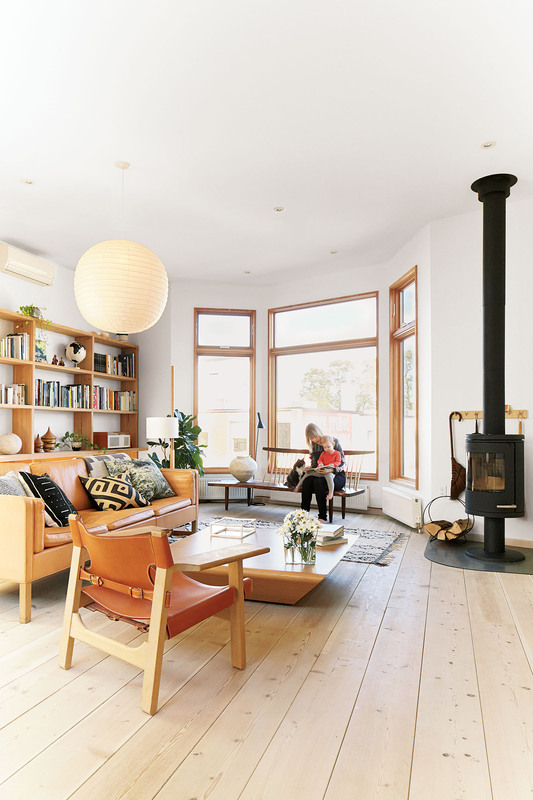 A pair of Toronto boutique owners and their architects surpass expectations for above-the-shop living with a renovation that celebrates clean design and serene space. Photo by Derek Shapton. For an architect’s family getaway in Connecticut, the kitchen is no shrinking violet. The basic idea for the house is a simple wooden box which Schaffer "manipulated to the maximum degree,” creating "solid and void where light and views of the rocky shoreline of the Long Island Sound could be drawn inside.” Large windows are installed flush to the siding for a seamless effect. Photo by Daniel Shea. For a vintage design dealer seeking a respite from the city, architect William Massie conceptualized a mostly prefab home around a carefully curated furniture collection in upstate New York. Photo by Karina Tengberg. The late architect David Boone was always one to take his work home with him—he just kept it in the home’s office. The new residents of his 1972 house embrace a more fluid approach to the live/work divide. Photo by Noah Webb. A couple in northern Italy trade a cramped flat for a renovated farmhouse in the country. Photo by Helenio Barbetta. A couple takes a minimalist approach to their Brooklyn apartment, focusing on supple materials, subtle gradations of color, and custom finishes by local craftsmen. Photo by Matthew Williams. After Will Rosenzweig and Carla Fracchia bought this 100-year-old farmhouse in Healdsburg, California, they hired Arkin Tilt Architects and Earthtone Construction to make an eco-friendly example out of it. The house had good bones but it was "thermally challenged in both summer and winter," says architect Anni Tilt. Thanks to the addition of a new wrap of rigid insulation on the exterior, new windows throughout, a ventilated roof, and a new wing with shade overhangs, the house is transformed. "It now provides an entirely different level of comfort and performance—a quantum leap forward—which has transformed the way we use it," the owners report. Photo courtesy of Edward Caldwell. Athens, Greece, the cradle of classical architecture, is home to this modern renovation of an 810-square-foot apartment. The pied-à-terre's location in Plaka, the historic neighborhood at the foot of the Acropolis, posed quite the challenge for the architects at K-Studio. They faced stringent oversight from the city's archaeology department, who had to place their seal of approval on all design and structural work. To that end, the Slab apartment is an enclave of contemporary simplicity within a neoclassical shell erected at the turn of the 19th century. In an up-and-coming area of Copenhagen, a pair of designers and their twin girls inhabit a converted loft, filling it with serious design savvy and a hefty dose of creativity. Photo by Anders Hviid. If not for the dawn appearance of the bear, which came loping toward Maem Slater-Enns and her then six-month-old daughter as they sat contemplating the water, the Enns family might still be residing in tents at their remote island summer home on Shoal Lake, which straddles the borders of Manitoba and Ontario. Photo by Thomas Fricke.